Getty ImagesUS President Donald speaks as Agriculture Secretary Sonny Perdue looks on. Two high-ranking Trump administration officials have recently compared Trump’s trade war with China to a weight-loss program. “I liken it a little bit to going on a diet,” Commerce Secretary Wilbur Ross said July 31. It’s unclear whether that is the case. Members of President Donald Trump’s administration have been trying for months to explain the benefit of the president’s trade war, and now officials appear to have developed an odd new comparison to help get the public on board with the tariffs. 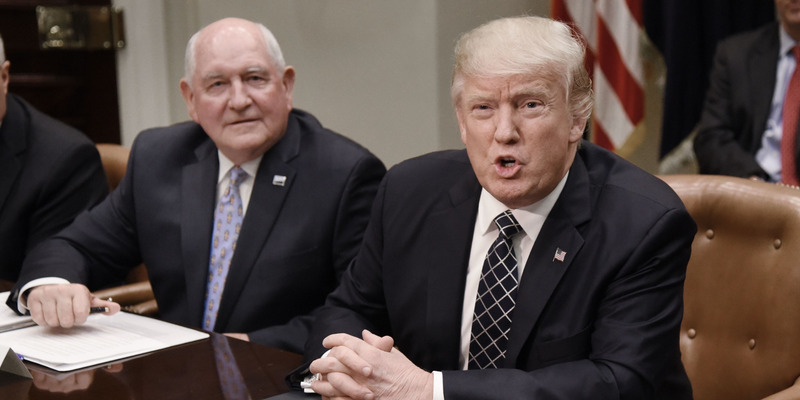 Both Commerce Secretary Wilbur Ross and Agriculture Secretary Sonny Perdue have compared Trump’s tariffs to a weight loss regimen over the past handful of weeks. Both officials promised that the economic pain of the trade fights will pay off in the end. The simile appears to suggest that the short-term economic losses from the tariffs will be made up for once, as Trump called them on Wednesday, “great new Trade Deals” are reached. Since March, Trump has imposed tariffs on steel and aluminium imports to the US as well as on $US34 billion worth of Chinese imports. Tariffs on another $US16 billion of Chinese goods are scheduled to go into effect on August 23, and Trump threatened to impose restrictions on all $US550 billion worth of Chinese imports if necessary. As it stands now, the “pain” appears to be hitting US manufacturers and many farmers. On the manufacturer side, increasing costs for parts have forced companies to delay investments, lay off workers, and move operations away from the US. On the farmers’ side, prices of crops like soybeans and corn have nosedived, cutting into already precarious revenues. But unlike a diet, those companies dealing with the “pain” have no control over the length of the trade fights, and the lack of a clear endpoint or goal also separates the reality from the Trump administration’s comparison. Trump officials suggested that the short-term pain of the tariffs will make the US “healthier in the end” due to a beneficial trade deal between China and the US. But so far negotiations have so far yielded no real progress and its unclear when such a deal will get done. The negotiations have reportedly been a mess, with Chinese officials having no idea which members of the administration actually speak for Trump. Trump’s lack of a clear goal for the deal has also been a complicating factor.